The next stage of my journey saw me heading to the Vipassana center in Prachinburi. After reaching Bangkok from Udon Thani, Paiboon and I parted ways as he was going to another Vipassana center. While waiting for the bus, I wasn’t quite so sure what to expect. 10 straight days of meditation, starting at 4:30AM in the morning, without any books, music players, TVs or writing materials allowed â€“ not to mention no talking at all? So now that it’s over, what was it like? The Vipassana center in Prachinburi, tucked away in a tranquil location. Itâ€™s hard to describe really. 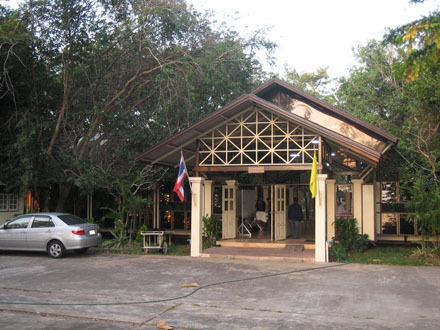 The Prachinburi center was the first Vipassana center in Thailand and is around 20 years old. It shows, although the facilities were more modern than Wat Pa Don Hiay Soke (toilets with flushes for one). 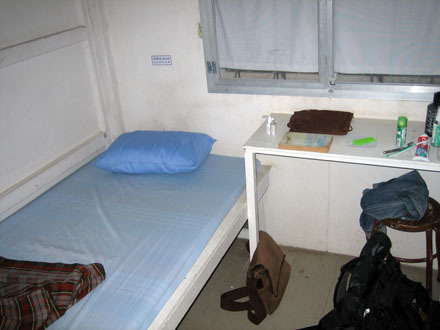 The sleeping quarters were simple, thinly boarded off cells with 1-2â€ mattresses for a bed. It was also in a remote area, very quiet and tranquil which helped a lot with the daily meditation. My room in Prachinburi, taken on the last day which explains the book. The meditation schedule itself was intense. Morning bell rang at 4am; morning meditation was from 4:30 to 6:30, followed by breakfast and break until 8. Meditation then continued until 11, followed by a 2-hour break for lunch and rest. We resumed afternoon meditation from 1 till 5pm, after which we had light snacks and a rest until 6. From 6pm we meditated for an hour, watched the evening video discourses by S.N. Goenka, a leading teacher of Vipassana meditation, then resumed meditation, usually for about 20 minutes until 9pm, and finally lights out at 10. Iâ€™ll be the first to admit that I didnâ€™t last throughout all meditation sessions, and I overslept on a couple of days. I am proud to say that I lasted throughout all Seatings of Strong Determination; an hour long meditation session where you were do to keep completely still with eyes closed, 3 times a day starting from day 4 or 5. Those were extremely hard, with your mind and body both screaming at you to just get up and leave, not knowing just how near or far away you were to the finishing point. It was amazing how fast my mind became quiet in the center through the quiet environment, light vegetarian diet and constant meditation. It helped that I had a head-start at Wat Pa Don Hiay Soke, but I was going to find out that it wasn’t to last.